Sony has stirred up the market for the mirrorless cameras by releasing the Sony Alpha A6000. This camera is priced to compete with the mid-range consumer DSLR’s, but has got features that wouldn’t look bad on a high-end consumer DSLR. In this extensive review I’ll tell you more about the Sony Alpha A6000, the features and the great image quality. Click ‘read more’ to read the full review. Klik hier om de Nederlandstalige review van dit artikel te lezen. Last summer vacation I took only a few photo’s (at least compared to other years). Since 2011 I happily used a Nikon D7000 with the kit 18-105mm lens and a Nikon 35 mm f1.8 lens. The high weight and the size of the D7000 started bugging me more and more. That was the reason I didn’t take a lot of pictures on my vacation. Many times I didn’t bother to take the big, heavy camera bag and when I did I only got my camera out on special occasions. It did get me thinking about other options, I was ready to get rid of my big DSLR but I didn’t want to give up on my hobby. I didn’t want to trade in photo quality, flexibility (ability to change lenses) and I didn’t want a simple point and shoot where you need to plough thru several menus to change a simple setting. If you combine those wishes with the need for a smaller and lighter camera you’ll find yourself looking at a mirrorless camera. My ‘old’ brand Nikon does offer those, but they use small sensors which results in a very fast camera but you lose image quality compared to an APS-C sized sensor. And with the smaller sensors you lose some ability to play with the depth of field. And besides those concerns, the new high-end model the Nikon 1 V3 is far from cheap. I had been looking at Sony for some time. Sony is one of the few brands that offers a mirrorless camera with an APS-C sized sensor (and they even have a upgrade path with the A7- series with the full frame sensors). 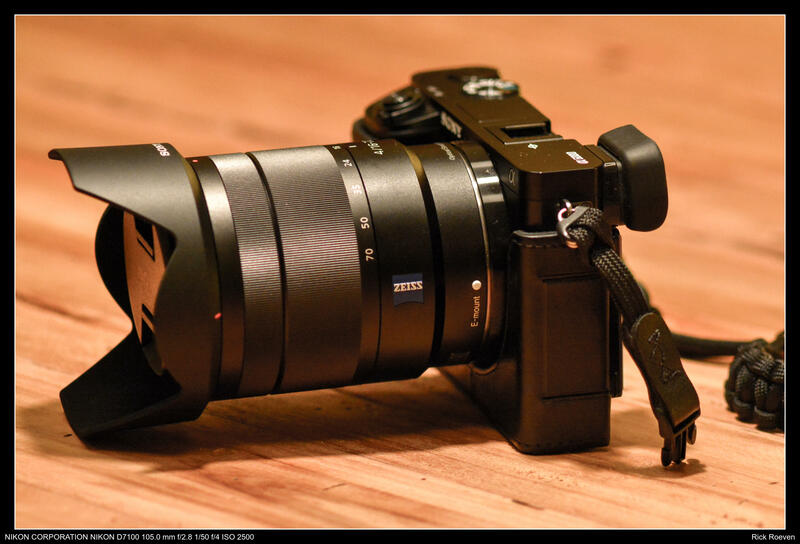 The top of the line APS-C mirrorless Sony NEX 7 seemed to be the ideal replacement for my Nikon D7000. But Sony had just released a new model, the Sony Alpha A6000. It has the same resolution (24 MP) as the NEX 7, but had upgraded sensor with faster autofocus (with a whopping 200 autofocus points) and a lightning fast burstrate of 11 frames per second. Compared to the top of the line NEX 7 it misses the ultra-high resolution EVF (the A6000 has an 800*600 pixels EVF instead of the 1024*768 pixels of the NEX 7) and you lose one of the two adjustment wheels the NEX 7 does have. The A6000’s introduction price is a little lighter on your wallet, so it’s a fair trade-off if you ask me. At this moment (December 2014) the A6000 costs about €700, with the 16-50 mm powerzoom kit lens. Lets find out more about Sony’s mirrorless powerhouse. 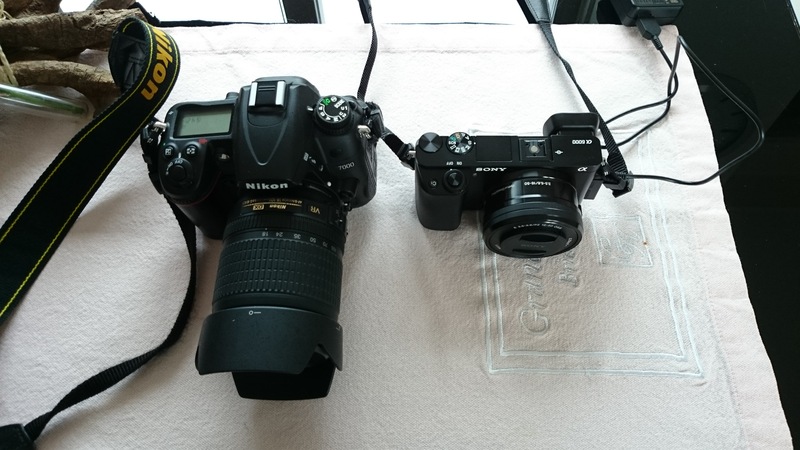 The Sony Alpha A6000 next to my old Nikon D7000 with the kit lens. Quite a size difference. All the photo’s in this review are taken with the Sony 16-50 mm powerzoom kit lens, the Sony Zeiss 24 mm f1.8 prime lens (read my review about this lens here) and the Sony Zeiss 16-70 mm f4 premium zoomlens (read my review of this lens here). Since the A6000 has been my only serious camera I borrowed a D7100 from a friend to take some picture of the camera. The rest of the photo’s I borrowed from the site of Sony Netherlands. I bought my A6000 in black. You can also buy it in silver, but I don’t like the look of the silver version. The body is made out of sturdy metal, and feels very well built (especially when compared to DSLR’s in the same price range). It’s got a small grip, covered in a rubber coating. The battery / SD-card cover is the only part where the build quality dissapoints. On my A6000 it’s hard to get it open and it feels a little cheap, luckily you can charge the camera with a USB charger without taking the battery out. The A6000 has got a small built-in flash. You can use it in the normal position to fill-in, but because of the design of the unit you can pull it backwards with your finger and bounce the light of the ceiling to avoid the awkward ‘flash-look’ on your photos. With my big hands the grip of the A6000 is a little small, especially when shooting for long extended periods. I solved that by buying the original Sony (fake-) leather camera cover. This is attached to the tripod-mount on the bottom of the camera. The cover has got a tripod-mount of its own, so you don’t need to take it off to mount the camera on a tripod. The cover adds about a centimetre to the bottom of the camera, making it easier to hold with big hands. Since it’s got a flap you can access the USB- and HDMI-ports thru the cover. To get to the SD-card or battery you do have to take the cover off. Like many DSLR users I was quite fond of the load of buttons and dials on my DSLR, making it easy to adjust your settings on the fly. The A6000 is also blessed with a lot of buttons and dials, the most important one being the trusty PASM-dial on top. So switching from Manual to Aperture, Shutterspeed or Program-setting is easy. On the PASM-dial you’ll also find the panorama-mode (which works quite well actually), the automatic-modes (the A6000 has got two), video-, memory- and scene-mode. The PASM-dial is used in combination with the second unmarked dial and the multi-jog on the back of the camera. In A-mode you can change the aperture with the second dial and in M mode you can change the shutterspeed with the second dial and the aperture with the multi-jog on the back. Back of the A6000 with the controls. The multi-jog is a true work of art. You can spin it around, use it as a 4-point joystick to navigate the menus and use the central button in it as the ‘Enter’ button. The multi-jog also gives you direct access to the transport-mode, ISO-settings and display-settings. Using the multi-jog is great, it works like a charm. If you want to change other settings you can either use the full menu or use the customizable FN-menu. The FN-menu has got a lot of preset options, but it is completely customizable . You can choose which options you want to see in the FN-menu, and in which order you want them. Besides the FN-menu you have two customizable buttons, the C1 and C2. I set the C1 button to switch between Manual and Autofocus and the other one to switch to the focus magnification. Being a mirrorless camera (as the name suggest) it doesn’t have a mirror and a pentaprism like a DSLR, so it doesn’t have an optical viewfinder. Instead of the optical viewfinder you get a EVF (electronic viewfinder), which basically is a small screen as an viewfinder. I was afraid I’d miss the optical viewfinder, but I’ve grown to love the EVF. The A6000’s EVF has got a resolution of 800*600 pixels, which is more than enough to get an sharp and clear image. The EVF-image does have a minor lag, but that’s so little it doesn’t affect the use much. What I love about the EVF is the realtime view of the settings and the way they affect your image, so you can see the DOF and the effect of changing you settings before taking the photo. Another great point of the EVF is that you can review your images in the EVF after taking it without taking the camera off your eye. In very dark situations the EVF can get a little noisy. The only downside of an EVF is that it uses a lot more power than an optical viewfinder or even a LCD-screen. With my D7000 I sometimes managed to get thru a whole vacation without charging the battery since you could take about 1500 photos on one charge, that’s not going to work with the A6000. Sony thinks you can take about 360 pictures on one charge. So if you go out for a very long shoot you may need a second battery. What I do like is the option to charge the camera using a Micro-USB cable, so you can use about any standard phone charger you have laying around to fill your camera battery up. Since I have one in my car I can even charge it on the go. The screen of the A6000 is 3 inches, and sharp enough to check the photo’s you took or to change your settings. Because of the good brightness of the screen you can also use it in bright sunlight. Like you may expect from an enthusiast camera the screens offers a lot of usable information, like a (-live) histogram, extended EXIF information or an overview of all your settings. You can tilt the screen up and down, the mechanism feels sturdy enough. I never missed the tilting screen on my D7000, but I love having it on my A6000 more than I thought I would. Especially when taking photo’s close to the ground or high up. Luckily the screen doesn’t flip up or down 180 degrees so it doesn’t have a idiotic selfie-mode. This is where the A6000 shines. The camera can take about 11 photos per second, which is way faster than most DSLR’s since it doesn’t have a mirror that has to keep flapping up and down. The most amazing thing about the high speed is that it can keep focussing between the photos without slowing down. There aren’t a lot of cameras that can come close to that. You do need a fast SD(XC) card to keep up with the speed of the camera though. The A6000 has got a large buffer so it can keep the speed up for quite a while, even when shooting RAW. But after a burst the camera needs to write all the data to the SD card, and while doing that the camera is blocked. You can take new photos, but you can’t access any of the menus or change settings. With an slow SD card it can take quite a while before the buffer is emptied, when you use a fast SDXC card with a UHS-I rating it takes about 10 seconds to clear the full buffer. In day to day shooting you probably never use the 11 fps setting, because one subtle touch of the shutter button will give you 3-4 photos. The A6000 in silver, I think the black one looks better. The autofocus system of the A6000 also is very fast. Sony says it’s the fasted system in its class. In good light it certainly is fast, and the A6000 can even keep up with most DSLR’s. When there is less light the camera will focus accurate most of the time, but you lose a lot of the speed. In low light my old D7000 was a lot faster. The A6000 focuses so fast because it is equipped with 179 phase detection autofocus point (PDAF). These PDAF points are spread evenly over the whole sensor, instead of clustered in the centre like most DSLR’s have. The system is about the same as a DSLR uses, but on the A6000 these focus points are built in to the sensor itself. On a DSLR the autofocus system is located in a separate unit that uses the mirror to look thru the lens, so it can’t be used in live view or when filming. Besides the PDAF the A6000 also has 25 contrast detection autofocus points (CDAF). Those are used to do the last small corrections to the first focus it does with the PDAF, because PDAF is a little less accurate. With all original Sony E-mount lenses the camera can use both systems to focus fast and accurate. When using third party lenses it can only use the CDAF, so focusing is slower. Sony has added a lot of smart little extras to the A6000. Most of those are extras you never missed on your old camera because you never had the pleasure to use them. The camera is equipped with NFC and Wi-Fi. The NFC will let your camera connect with a NFC equipped phone with just one touch between the phone and the side of the camera. The camera and phone find each other using NFC and connect via Wi-Fi, which gives you serval useful options. For instance you can send a small (2 MP) copy of the photos you took to your phone so you can share them on social networks or email them. Even better is the option to use your phone as a second screen and remote control for your camera. The live image on your phone does lag a little, but is it usable to position your camera and check the composition. You can also change some of the settings, and even zoom if you have a lens with power zoom attached to your camera. The camera can also use the Wi-Fi connection to connect to your home network and upload photos to you network or upload them straight to your favourite social networks. It is also equipped with apps, and you can add new apps via the Sony app store on the camera. There are a lot of free apps, and there is a selection of paid apps (ranging from 1 to about 10 euros). For instance there is a rather nice timelaps app, to make timelaps videos. This is what it’s all about. It is also the point where the A6000 has surprised me the most. This tiny, lightweight camera is capable of taking better photos than my bulky DSLR! The A6000 is equipped with one of the most impressive APS-C sized sensors on the market, with a high resolution, low noise and a high dynamic range. Taking photos you don’t have to be afraid to crank the ISO up to about 3200 without losing to much quality. In challenging situations you can even go up to ISO 6400, and with a little work in post processing get acceptable photos. Going beyond ISO 6400 you will lose a lot of detail because of the noise. One point where the A6000 outperforms my old D7000 is dynamic range. 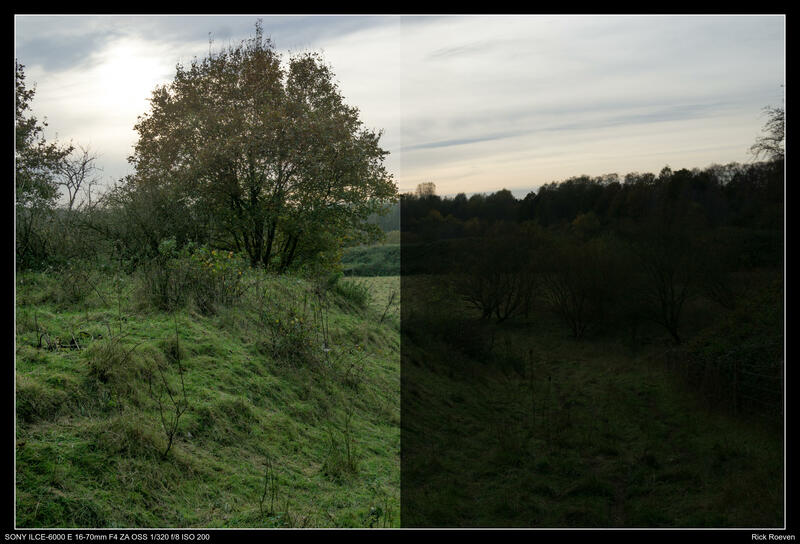 As you can see in the example below it is possible to recover a lot of information from a (deliberately) underexposed image in post processing. In the example below I adjusted the left side, and left the rest of the photo like it came out of the camera. To optimize the image you would have to adjust the colours in the left side of the image to get the best result but it does give you a good idea of the capabilities of this sensor. In the following gallery you’ll find some examples of the photos I took with the A6000 using the Kit lens, the 24 mm Zeiss, 16-70 mm Zeiss, Mitakon Speedmaster 50 mm f0.95 and my legacy Pentax SMC 50 mm f1.7 and Minolta Tele-Rokkor 135 mm f2.8. Almost all photos are shot in RAW and later edited in Lightroom. With the Sony Alpha A6000 Sony has released an impressive piece of photo equipment, for an acceptable price. If you think going smaller and lighter you will have to trade in image quality you would be wrong. The earlier mirrorless cameras may have been a compromise between size, weight, speed and image quality, but those days are over. The Alpha A6000 can take on midrange to high-end APS-C DSLR cameras like the Nikon D5300 and D7100 when it comes to image quality. Add the smart functionality Sony has built in to the camera to the great image quality and you’ll have one of the best pieces of equipment an enthusiast amateur photographer can ask for. The A6000 is a great introduction to the Sony mirrorless camera line, and can be a great step up to one of the full frame models like the Sony A7. You can also use one of the following links to buy this great camera. It doesn’t cost you extra, and I’ll get a small commission for every sale. I noticed in your photo collection what appears to be a Nova Scotia Duck Tolling retriever. Great dogs. Hi Jeff, thanks for your reply. And you’re right, it’s our 2 year old Nova Scotia Duck Tolling Retriever. He is alway willing to pose for my photo’s. In The Netherlands it still is a rather unknown breed, but we love them! I have this same camera and love it too. Just curious, what kind of camera bag do you use? I have only 2 lenses and a really small travel tripod so want something small. Nice Blog! I do live and work here in Rotterdam and I do have the same DSLR as yours (Nikon D7000 purchased at Foka.nl way back 2012). I’ve been so slow in convincing my self to swap my Nikon D7000 Body+Nikon MB-D11 for the Sony A6000 + 16-50 PZ kit. I had so much fun with my D7000+50 f1.8+2 SB 700 (strobist) but I am aching for upgrade and latest gadget . Couple of questions I had in mind is is it really that good compare to Nikon D7000 image wise (as it is what I have) besides its high resolution and long list of gadget blings…I will still keep my 50f1.8 and SB-700s for future DSLR come back or I might find someway to use the SB-700s to use with Sony A6000 using remotes. Thanks! Hi Dennis, thanks for your reply. In my opinion the A6000 performs a lot better than the Nikon. The sensor in the A6000 delivers more dynamic range and better noise performance (and of course the higher resolution). The 16-50pz isn’t the best lens to take advantage of the sensor in the Sony. It’s okay, very small and light, but don’t expect stellar performance. One great thing about the A6000 is that it can be adapted to use lenses from other brands. So if you buy an adapter for your Nikon 50mm you can use it on the Sony (with manual focus). A second great thing about the Sony is that it has a universal flash shoe, so your Nikon flashes can be used (it will fire but you don’t get TTL functionality, do you have to set the flash output manually). All in all I think the Sony won’t disappoint, and maybe it will give you so much pleasure you’ll also upgrade to an A7 in time like I did after using the A6000 for some time! It took a while but I finally gave in. Went to the shop with my 2.5 year old Nikon D7000 + MB-D11 and they gave me a 46.5% discount for a brand new Sony A6000 + 16-50 kit (699 Euro/kit), not bad!…took it for a magic hour photography at Erasmus Bridge and I was really happy with the result, the 16-50 works fine for M / f11 / ISO 100 / 30″ set up…so happy that I went back and ruilen my another 2.5 year old Nikon 50mm f1.8 AFS G instead of buying the adapter and took a Sigma 60mm f2.8 (black) and got another 50% discount…I set it up with my 2 x Nikon SB-700 with Hahnel Trigger with the transmitter on my Sony A6000 (which is intended for Nikon) and boom, the lens was sharp and the Speedlights fires though you’re right that the TTL is gone but it is fine with me since it pushes me to come back to Manual Flash Settings esp. for modelling. I also try the SB-700 on top of A6000 but it looks odd and the weight is not balance but yes it fires. Another thing is my Nikon SU-800 doesn’t work at all. it communicates with the SB-700 on test fire on top of A6000 but did not work on actual shot, I guess the SU-800’s complexity makes it hard to communicate with ISO hot shoe unlike the simplicity of Hahnel Transmitter. Overall it really didn’t disappoint me, got a good deal, a new photography gear and my back pack went really light…the A7 models is out of my reach. I’ll just wait for the next APSC model that they will release and hope the price doesn’t “drastically increase” like 200 or 300 euro plus with each new model to come out. For now I’ll enjoy using it! Thanks! Hey Dennis, great to hear you took the plunge and are enyoing the new camera. Have fun shooting! my nex..t camera wil be a sony a 6000 (instead of my sony a 580). Hi Rick, what camera strap are you using in the photo? I’m having a hard time finding the right one that has quick release. Nice reviews, good to hear balanced opinions from an end user. Thanks for your comment! 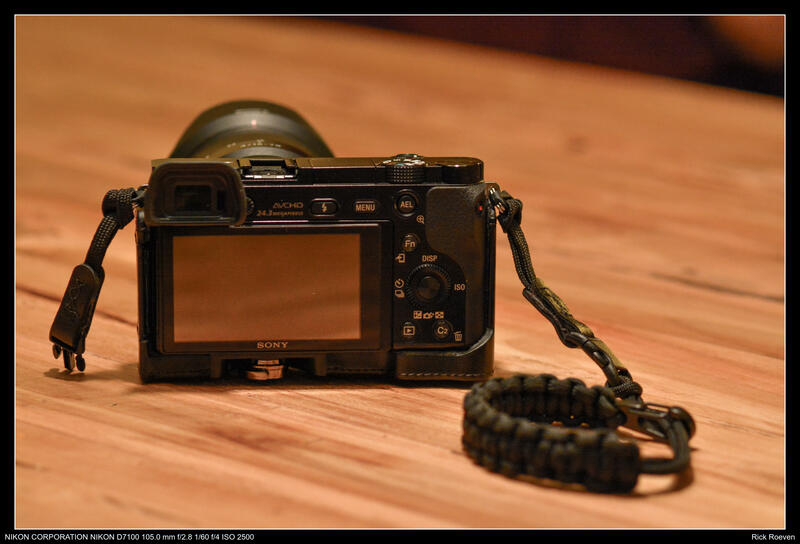 The strap in the pictures is the DSPTCH wrist strap: DSPTCH review. 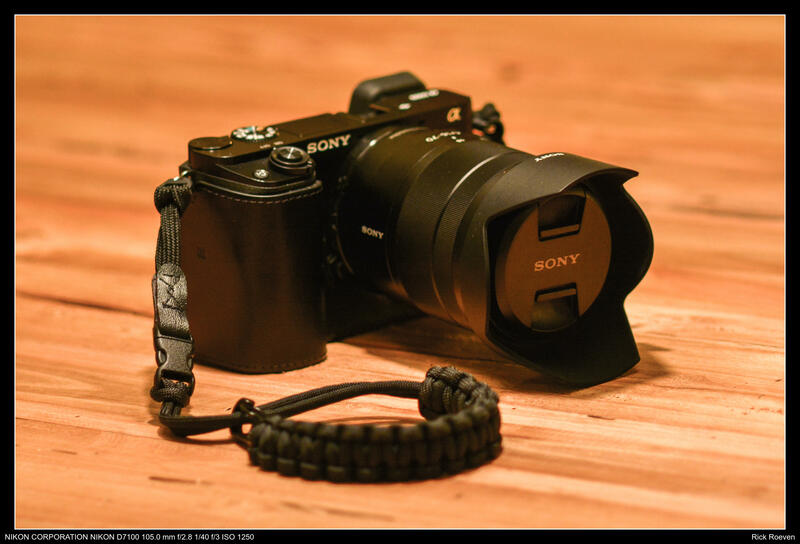 Another great strap with a quick release is the 4V Design leather strap: 4V design Strap. I agree about the lenses, Sony is still quite expensive. I’ve recently bought a LA-EA4 adapter and some old Minolta AF lenses (the 50mm f1.7 AF for 60 euro’s and the 70-210 f4 ‘beercan’ for 80 euro’s), those are great, sharp and cheap. And you can use that adapter and the lenses on both the APS-C, as the Full Frame E-mount cameras. Maybe worth checking out! Thinking about getting the a6000—6300/6500 incerment too high. But I also have big hands. I don’t see the cover you got to make it bigger. A few different ones on ebay would probably suffice? The leather cover I had with my A6000 did add about a 1/2 to 3/4th of an inch to the height of the camera. That was just enough for me to find room to put my little finger and get some extra grip. It did also make the grip just a little more substantial, so it helped me in that way also. The difference isn’t enormous, but just enough for me and my medium-big size hands. If you have pro-basketballer hands that may not be enough though. I want to buy a zoom lens for my sony a6000. Can you recommend one for the amateur photographer that I am? Nothing too sophisticated and complicated. Hoi Scarlett, het is moeilijk om daar een algemeen antwoord op te geven. Wat mis je met je huidige lens? Zoek je meer zoom bereik? Dan zou je eens kunnen kijken naar de Sony 18-105mm F4 PZ. Als je een lichtsterker objectief zoekt zou je eens kunnen kijken naar een prime objectief, zoals de Sony 35mm f1.8 of Sigma 30mm. Maar het begint met de vraag wat je nodig hebt en wat je wilt fotograferen. Hi Scarlett, it’s hard to give u one answer to that question. What’s missing in your current lens? If you are looking for more zoom range you could look at the Sony 18-105mm f4 PZ. If you need a brighter lens you could look at a prime lens like the Sony 35mm f1.8 or the Sigma 30mm. But it all starts with the question what you want to photograph and what you need. Hi Rick, Dank voor je antwoord. Ik heb helemaal nog geen zoomlens op dit moment. En ik wil gewoon af en toe dingen wat dichterbij halen, niet ingewikkelds. Dan is de Sony 16-50 power zoom een goedkope en eenvoudige oplossing. De Sony 18-105 F4 is een duurder, groter en zwaarder maar veelzijdiger alternatief. Beide zijn kwalitatief prima voor casual gebruik. Hartstikke bedankt, Rick. Ik denk dat die eerste het gaat worden. Ik wens je alvast een goed 2018! Nog even, Rick. Werkt de lens handmatig of electrisch? Beide werken met een zoom motor en zijn dus electrisch. Ik neem aan dat ik als dat ding op de camera zit, er ook in het menu iets komt waar ik de zoomlengte kan aangeven? Dat doe je met een knopje op de lens, daarmee kun je makkelijk in en uitzoomen. Werkt erg fijn, zeker voor filmen is powerzoom erg prettig. Goede jaarwisseling en veel succes! And you have to think about zoom vs. primes. Zoom being more flexible, prime offering better brightness and optics. I’m a prime fan, but zoom is much easier to use. If you don’t want to upgrade to full frame I’d go: Sigma 19 mm 2.8, Sony 30mm f3.5 Macro and Sony 55-210, that is an affordable, small kit that will do just about anything you need. Add a Sony 18-105 f4 PZ for all-round use and you’ll be able to tackle any situation. Hope that helps, otherwise just send me a message.